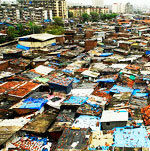 City Mayors: Dharavi - Slum or model village? 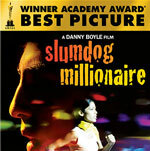 21 June 2011: Dharavi is Asia’s largest and the world’s second-largest ‘slum’, made famous by the film Slumdog Millionaire. Maharashtra’s state government now has plans to re-develop large parts of it. City Mayors’ Urban Development Consultant, Prakash M Apte, describes the plans as perhaps well meaning but certainly misguided. He calls for a remodelling of Dharavi. Prince Charles agrees with him, arguing Dharavi offered a better model than western architecture for housing a booming urban population in the developing world. Dharavi spreads over parts of the municipal wards of Sion, Bandra, Kurla and Kalina in suburban Mumbai. It is sandwiched between Mahim in the west and Sion in the east and comprises 175 hectares; Present day Dharavi has a population, of more than 600,000. Dharavi lies between Mumbai's two main suburban railway lines, the Western and Central. To its west are Mahim and Bandra, and to the north the Mithi River which flows through the Mahim Creek into the Arabian Sea. To the South and east are Sion and Matunga. Dharavi’s location and poor drainage render it vulnerable to monsoon floods. 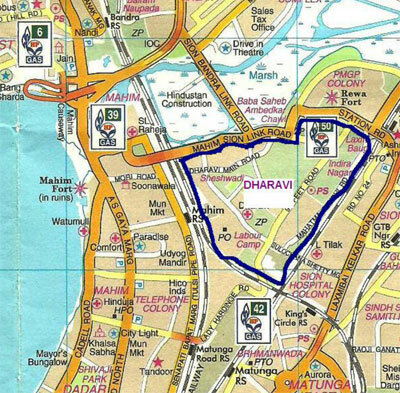 In the 18th century Dharavi was an island. The area was mostly mangrove swamp inhabited by Koli fishermen. This disappeared when the swamps were drained and the separate islands became one landmass, leading to the creation of Bombay, now Mumbai. This caused the creek to dry up, thus depriving Dharavi of fish, its traditional sustenance. The newly filled in marshes provided space for migrants from Gujarat, who established a pottery colony. Maharashtrian tanners of the ‘Chambhar’ (leather workers) community also arrived. Embroidery workers from Uttar Pradesh started the ready-made garments trade, while Tamil migrants began working in the tanneries. Dharavi pulsates with economic activity. Its population, with no outside help, has achieved a uniquely informal economic system of self-help. Residents, bereft of proper housing, have nevertheless risen from poverty by establishing thousands of successful businesses. A study by the Centre for Environmental Planning and Technology (CEPT, Ahmedabad) found some 5,000 industrial units producing garments, pottery, leather goods and steel fabrication; and services such as recycling and printing. Its recycling industry, which processes waste from Mumbai, is expanding fast. 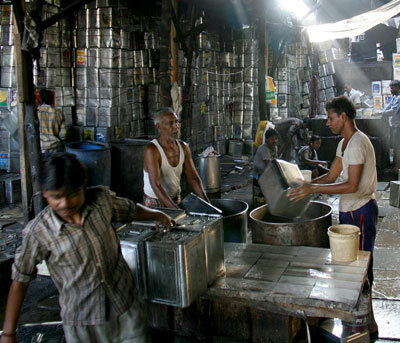 Dharavi has an estimated 15,000 single-room factories. Many products are distributed worldwide. The annual value of goods produced is conservatively estimated at US$500m. Its productive activities are extraordinary  they occur in almost every home. Economic activity is decentralised, human in scale, home-based, low-tech and labour-intensive. The result is a pedestrianised, organic, low-rise community-centric landscape. It is network-based, with mixed use and high density  but unfortunately depicted as a ‘slum’. This is due to lack of basic facilities such as roads, housing with individual toilets, and public amenities. Dharavi, however, is not a slum but a unique self-contained township. Prince Charles said, Dharavi offered a better model than western architecture for housing ‘a booming urban population in the developing world’. He warned that soaring urban populations could only be accommodated without social and environmental disaster by local urban design rather than ‘a single monoculture of globalization’. Dharavi, he said, possessed such attributes with its use of local materials, walkable neighbourhoods, and mixture of employment and housing. It represents a design ‘totally absent from the faceless slab blocks that are still being built around the world to “warehouse” the poor’. The prince told planners: ‘I strongly believe that the west has much to learn from societies and places which, while sometimes poorer in material terms are infinitely richer in the ways in which they live and organize themselves as communities,’ adding that such communities will in future be ‘perceived as best equipped to face the challenges that confront us because they have a built-in resilience and genuinely durable ways of living’. Dharavi is not like other Indian slums, since it was not formed by migrants searching for work. The pre-existing village only grew by importing new skills as the scope for earning expanded. It represents Gandhi’s dream of ‘a self sufficient, self-sustaining village community’ - though lacking an adequate physical infrastructure . If Dharavi is redeveloped as an in situ development, its contribution to the city’s economy will continue and grow. But if residents were resettled in multi-storey towers with 30sq. metres cubbyhole apartments - as a US developer of Indian origin suggested, and which the state government accepted - erstwhile residents would find it impossible to carry on their work and contribute to the economy. Many jobs include textile and leather working, labelled as heavily polluting, which will be banned under the redevelopment plan. Except for leather working (and that only in tanning), none of the other jobs, like textiles, are even lightly polluting activities. In India the gulf between rich and poor is widening and the middle class is almost vanishing. There is rampant and blatant financial and moral corruption in the total system of governance. In these circumstances the only way to improve living conditions in the slums is to provide basic services like water supply, sewage disposal, and health care. If the state government has its way, by next year history's most ambitious slum-clearance project may have eliminated Dharavi, this beehive of human activity housing 600,000 people. The world's most written about ‘slum’, it is the source of billions of dollars, mostly from transforming waste into new products in make- shift factories of wood, corrugated metal and plastic sheeting. It will all be gone - replaced with a master-planned community giving families a 300sq. ft. house with running water, a toilet and electricity. These cubbyholes, devised by the Slum Redevelopment Authority, will be located in multi-storey concrete buildings provided free by developers or government agencies, which in return will enjoy the right to build 40m. sq. ft. of commercial projects and condominiums. This demolition may be well meaning, but is a totally misguided act of a reform-minded government intent on using the recent economic fortunes of India to improve ostensibly the unhygienic conditions of the poor in Dharavi. But in reality it is to reap multimillions of dollars in profit by selling office space and luxurious homes on the vacated land of Dharavi’s poor. Pseudo urban planners have drawn up ambitious plans, with designs for a ‘city in the sky’ with elevated walkways connecting clean apartment buildings. Development will be undertaken by ‘high-flying’ pseudo planners who have given no more than a token hearing to the well-established communities in Dharavi who will suffer from their plans. Are we then heading for the gentrification of Dharavi? This is where wealthier people will move into, renovate, and restore housing and sometimes businesses in inner cities or other depressed areas. The affordability gap is fundamental to explaining gentrification as an economic process. When sufficiently wide, real estate developers, aided by the government (as in Dharavi) and others with vested interests, see the potential profit from reinvesting in inner-city properties and redeveloping them for top-end buyers. This excludes the poor from affordable housing, leading to higher real estate prices and lease rates affordable only by the new occupants, not the original lower income inhabitants. The real estate market changes with gentrification. Even the small homes built for the original residents are often converted into condominiums or luxury housing available for purchase. The developers in Mumbai have demonstrated their ‘expertise’ in designing the 300sq. ft. apartments meant for the original slum dwellers in such a way that two, three, or four of them on a single floor can be amalgamated conveniently to form larger apartments for the affluent. As real estate changes, land use is also altered. Prior to gentrification these areas usually consist of low-income housing and sometimes light industry. Afterwards there is still housing but it is usually high-end, along with offices, retail, restaurants, and other forms of entertainment. Gentrification significantly affects culture and character. Over time, prices go up and the poorer people are priced out and replaced with the wealthy, who then demand better amenities. Housing stock and businesses change to meet them - again raising prices and forcing out the remaining poor. The wealthy are further attracted, thus perpetuating the cycle. The worst feature of gentrification is displacement of the original inhabitants. Retail chains, services, and social networks are also priced out and replaced with higher-end retailers and services. It is this aspect that causes the most tension between residents and developers. Every family in Dharavi has paid for its house through complex social arrangements that go back decades. They all get electricity, cable television and other services through non-official intricate networks. Families have been drawn to the ‘slum’ because of its fortune-making potential. They have carefully built livelihoods and an ad hoc system of social security. The crucial flaw in the Dharavi redevelopment plan (DRP) is that it is founded on the belief that its people are there because they have fallen out of mainstream society. It is presumed that nobody desires to live where it smells like a toilet and assumed that everyone prefers a solid roof to a sheet of plastic. It is taken for granted that people wish their children to be in safe, neat schools. Yet, like Dharavi, urban slums today are a vast improvement on rural poverty in India, particularly in Maharashtra where one farmer commits suicide every day! 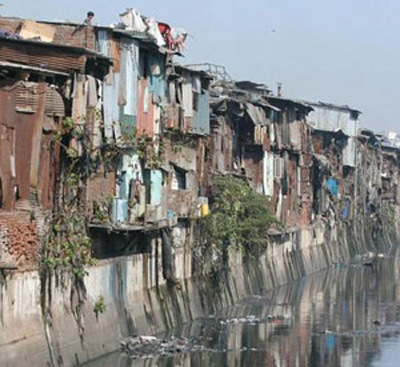 Over the past 40 years, more enlightened and less greedy governments (than in Maharashtra) in Asia and South America have adopted rational and saner ways of rehabilitation of slums by granting people title deeds on their tiny plots of land and providing minimal infrastructure such as sewerage systems and clean water. ‘The best plans generally let the slum dwellers themselves make the main decisions in planning their future,’ said Aprodicio Laquian, the Filipino-Canadian planner who practically invented the idea of slum-dweller-designed urban rehabilitation in the 1960s. Such schemes, known as ‘slum upgrading’ or ‘sites and services’, have been at the heart of the most successful urban renewal projects of the past 40 years. These are models that India and Mumbai should be emulating. But desires to plan from the top and bulldoze the aspirations of those who have built their lives in the slum, continue to win the day. 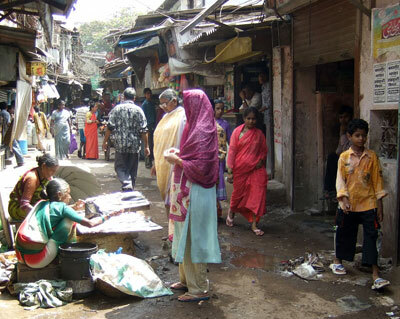 Dharavi contains the attributes for environmentally and socially sustainable settlements. Western developers, like the one who initially floated the idea of Dharavi’s redevelopment, often export plans for large-scale, high-rise buildings from developing countries without realising the richness of places like Dharavi. Mumbai has a population of about 18 million. Only about 35 per cent live in 'regular' permanent housing. The rest live in informal settlements, squatting on sidewalks and under bridges. Nearly 12 million occupy settlements on private and public open land, some of which are more than 50 years old. Dharavi is one of them. Dharavi’s 600,000 people live in 100,000 makeshift homes. It has one of the world’s highest population densities at more than 2,700 persons per hectare. It is adjacent to the expanding Bandra-Kurla Complex commercial centre that has overtaken Nariman Point, the current downtown of Mumbai. Dharavi is close to the domestic and international airports. Despite its plastic and tin structures and lack of infrastructure, Dharavi is a unique, vibrant, and thriving 'cottage' industry complex, the only one of its kind in the world. Its 'unplanned', and spontaneous development has led to the emergence of an economic model characterised by decentralised production relying on temporary work and self-employment. Production is flexible and adaptable and its viability is evidenced by the national and international markets reached. Unfortunately, these facts are overlooked and Dharavi is depicted as a 'slum'. In fact it is a unique self-contained township with close work-place relationship so eulogised since the days of Patrick Geddes - but never achieved in any of the new towns! Dharavi needs to be replicated (albeit with adequate physical infrastructure), not demolished. Instead, the state government’s intention of enforced relocation of people into cubby holes in high rise towers so that the vacated land can be commercially exploited means, At a conservative estimate, a developer could make a US$ 460m - a profit of at least 900 per cent! Would it not be rational, and just, to grant land tenure to existing residents so they themselves can redevelop the area and through self-help efforts gain access to institutional finance? Of course, but how then would developers reap rich harvests of millions of dollars for their personal benefit? Why is the in situ redevelopment approach of self-help - invariably suggested by experts all over the world and by financial institutions like the World Bank - not being adopted? There are three reasons: the politicians, bureaucrats and technocrats (the PBT combine) cannot proclaim their great ‘vision’ unless the solutions are seen to be grandiose and glamorous - and ‘newsworthy’ for the media; it precludes taking up huge capital investment projects that can generate equally huge kickbacks for the PBT combine; a scheme for acquiring over 500 hectares in a prime area of Mumbai in the name of slum clearance can generate astronomical redevelopment profits for the PBT combine. What is 'unique' about DRP is not its concept as claimed by its planners, but its Machiavellian attempt to deprive over 100,000 families of their traditional work and homes so that the land can 'host' commercial urban development that can ride piggy back on the infrastructure already created in BKC, at public expense, and benefit developers. The entire 535 acres is to be made available free to developers. In the suburbs of Mumbai, the floor space index (FSI) permissible is 1.00. This being treated as slum clearance, the FSI permissible would be 4.5 (Development Control Regulations-DCR- for Mumbai,1991). It means that in the 535 acres, after deducting statutory open space of 15 per cent, the total floor area that could be built will be 4.5 times the balance land (about 455 acres) - that is, 2,047.50 acres! For rehousing 100,000 families in 225sq. ft. Carpet area (approx. 330 sq. ft. built- up area) apartments, total floor area required would be around 757.50 acres. This would leave a balance of 1,290 acres of FSI for 'free sale' in the form of top-end apartments, offices, shopping malls by developers! 225sq.ft. each would not cost more than Rs. 250,000 per apartment (based on cost of resettlement in the World Bank-aided MUTP II project recently completed in Mumbai).The total cost of rehousing would therefore be Rs.2,500m or US$52.06m. Total land (inclusive of roads, open spaces and amenities) required for these 100,000 apartments in 20-storey buildings at the standards permitted by the Slum Redevelopment Authority (SRA) would be about 126.50 acres, leaving the balance of 408.50 acres for the developer constructing ‘free sale’ apartments and commercial space. At the current price (based on sale of land by Mumbai Metropolitan Region Development Authority-MMRDA) of around Rs. 28,000 per sq. metre (prices as in 2007) of FSI (floor space index) the FSI available for sale on the balance of land (1,290 acres) would fetch about Rs. 14448m, or US$328.36 m. Deducting the cost of 100,000 flats (US$56.80m.) there would be a clear profit of R11,948m or US$271.56m, a return of 478 per cent on the Investment! With current market prices this could double to 956 percent! Present proposals by SRA crams existing occupants into 15 per cent of land and takes away 85 per cent under the guise of economic feasibility! People must reject this plan and insist that at least 85 per cent of the land is used for the present occupants and only 15 per cent (at FSI of 1.00 only) for free sale apartments. A government professing to be for the poor must insist that at least 85 per cent of this area be used exclusively for rehousing the present occupiers in two-storey structures only, leaving adequate open area for the artisans for their work. Any plan for Dharavi must explicitly take into consideration the workplace relationship developed over the years, and not destroy the intricate urban structure that has sustained the local economy. But for the most part, the people of Dharavi have had little say in planning their community. Case studies all over the world have documented the inappropriateness of high-rise resettlements in poor areas. The social and economic networks, which the poor rely on for subsistence cannot be sustained in high-rise structures. Such projects are not appropriate for home-based economic activities, which are a major part of Dharavi. Unfortunately, the Dharavi Redevelopment Plan as a profit-maximizing real estate tool leaves no room for exploring such sustainable and economically viable low-rise, high-density approaches. It exposes the DRP for what it is - a weak cover-up for a land grab of the worst kind. With the recent rapid strides of the Indian economy, acceleration in the urbanization trend can be safely predicted. Every economy undergoing such rapid growth has witnessed higher levels of urbanization akin to what is taking place in China. Do India’s towns, cities and metropolitan centers have the institutional structures and resources to manage this transition?